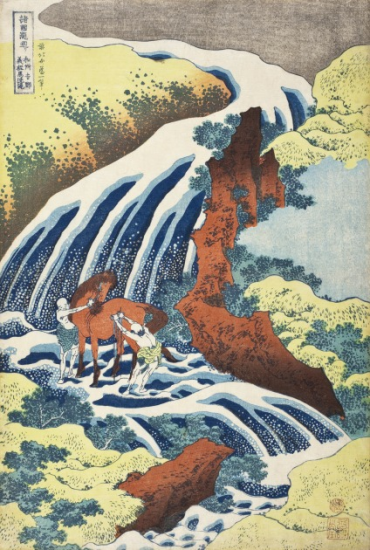 “Japanese Prints: Hokusai at LACMA” is on view through July 28 at the Los Angeles County Museum of Art’s Pavilion for Japanese Art, 5905 Wilshire Blvd., Los Angeles. In addition to these color woodblock prints, the current exhibition also features pages from woodblock printed books as well as preparatory drawings. Loans from the Barbara Bowman Collection include several surimono — commissioned prints made for specific occasions that typically employ special techniques or materials. This exhibition was made possible through the recent gift by Palevsky and through generous loans from the Barbara Bowman Collection. Designed by architect Bruce Goff (1904-1982), the Pavilion for Japanese Art houses the museum’s collection of Japanese works dating from around 3000 B.C. to the 21st century. The second-level West Wing gallery is devoted to archaeological materials, Buddhist and Shinto sculpture, ceramics, lacquer wares, textiles, armor, and cloisonné; the East Wing features paintings, primarily of the Edo period. On the plaza level, the Raymond and Frances Bushnell Gallery offers a rich array of the miniature sculptures known as netsuke. Museum hours: Monday, Tuesday and Thursday, 11 a.m. to 5 p.m.; Friday, 11 a.m. to 8 p.m.; Saturday and Sunday, 10 a.m. to 7 p.m. Closed Wednesdays. Admission: Free for members and kids under 18; $10 for seniors and students; $12 for groups of 10 or more; $15 for all other guests. Free admission after 3 p.m. Monday through Friday for L.A. County residents, on the second Tuesday of each month, and on selected federal holidays, sponsored by Target. For tickets and more information, visit www.lacma.org/.